I was recently sent a newspaper clipping from the Adelaide Advertiser dated 23rd March 1959 which tells a story which has been covered here before but adds a twist (thanks for the information, Katie). 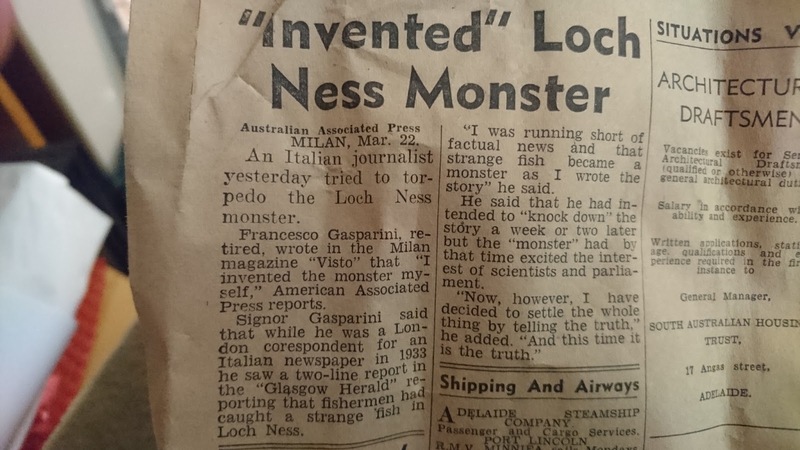 It concerns the Italian journalist, Francesco Gasparini, who claimed he invented the Loch Ness Monster back in 1933. The clipping is shown below and you can click on the image to read it more clearly. We have mentioned this man before in relation to another man who claimed ownership of the Nessie story. That other person was Digby Geharty, whom you can read about here and here. Neither man should be taken seriously as the parents of Nessie. Indeed, even the most seasoned sceptics cast doubt upon their claims. 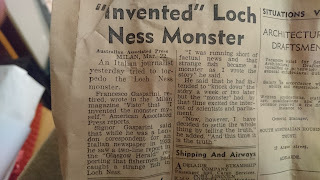 However, what caught my attention was Gasparini's claim that he saw a two line headline from the Glasgow Herald from 1933 stating that a strange fish had been caught in Loch Ness. Now, I do not recall seeing such an article, but I would not claim to have covered all of 1933. Alternatively, Gasparini may have made this up or simply misremembered after 26 years. My favoured theory is that he put a nearby strange fish story into Loch Ness. I think particularly of the fish caught near Findhorn in July 1934, which I reprinted here five years ago and from which I reproduce the picture below. But such a thing should not be put aside, so an archive search should be done. I have not done such a search yet, so I invite anyone else to see if there is any truth to this strange fish story. Wow, that image of the "strange creature" was wonderfully worked over. I can't tell which looks more wooden - the rigor mortish smiling "plank" in the foreground or the etched figures in the back. Lovely image. Great catch GB. I thought that too. I wonder what the original looked like? And I wonder what it is really. It looks superficially like an oarfish but not quite right. It really is a pity no one kept it in a jar. Its a loch "horse eel"
They didn't have 20 foot jars back then.